My friends, it is 1:12 am, and I think I know where I am. I am above the castle of Count Dracula, yes you read that well, I would recognize his castle between thousands. I can hear the wolves howling... I have to confess I am a little scared, I think I will try to stay awake all night, and keep an eye out for the bats which could come around and bite me in the neck. I hope to be there tomorrow, have a thought for me! 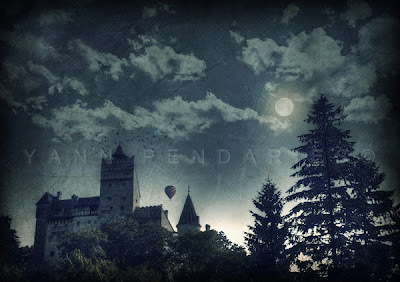 Bran, Romania - Castle Dracula 1:12 am"
How exciting Yann! Did I hear you are above Count Dracula's castle. Be carful not to get bitten;-) Stunning picture though! Evocative image-- Reminds me of the castle in Polanski's devil of a movie, THE NINTH GATE. Wow, evocative stuff. I am almost 99% certain I would have been sat on my terrace of my new villa, 3km to the north of the castle, sipping wine & smoking a cigar as you slipped through the night! Its where I spend most of my evenings & around that time, the villa was only just finished, so I'm almost sure I would have been out enjoying the incredible skies. If you come again, look up villa craisa branului on google, if you need a bed! This is a subject close to my heart, You have done a marvelous job, well done and thank you.